Star Wars fans will recognize the name sake for this drink (GIN instead of Jinn, get it?!! 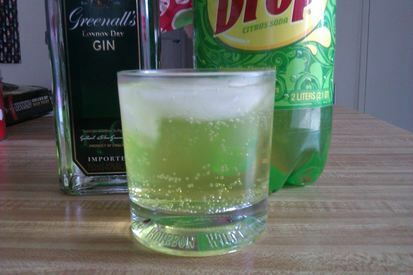 A simple mixture of Gin, in this case Greenall’s London Dry Gin and Sun Drop (or Mountain Dew), a soda that has enough Caffeine to keep you awake all weekend! Want something done from Dad this weekend? Make him one of these. He'll have tons of energy.